Bahrain’s Gulf Air and UAE’s Etihad Airways are set to explore deeper commercial co-operation following the signing of an agreement leading to further improvement in the fields of cargo, engineering, guest experience and optimizing pilot training facilities. The wide-ranging MOU inked at the Bahrain International Airshow plans to introduce codeshare operations between Abu Dhabi and Manama, as well as on the global flight networks beyond the two carriers’ GCC hubs. 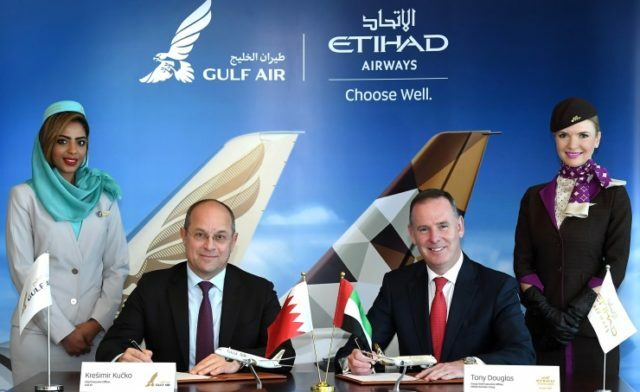 The signing ceremony was held at Etihad Airways Headquarters in Abu Dhabi, attended by Tony Douglas, CEO of Etihad Aviation Group, and Krešimir Kučko, CEO of Gulf Air, Bahrain. 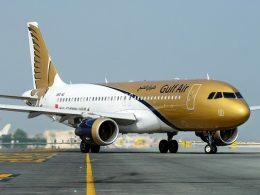 In accordance with the agreement, Gulf Air will place its ‘GF’ code on Etihad flights from Abu Dhabi to and from Bahrain, Brisbane, Chicago O’Hare, Jakarta, Lagos, Los Angeles, Melbourne, New York JFK, Sydney and Washington similarly Etihad will place its ‘EY’ code on Gulf Air flights from Bahrain to and from Abu Dhabi, Baghdad, Casablanca, Dhaka, Faisalabad, Larnaca, Malaga, Multan, Najaf, Peshawar, Sialkot and Tbilisi. The signed MOU will further enrich the relationship and co-operation between the two countries and their respective carriers to achieve mutual benefits and greater commercial goals, Kucko added. Tony Douglas, also remarked on the deep ties between Abu Dhabi and Manama dating back nearly 70 years ago. The mutual coordination between two flag carriers Etihad and Gulf Air will significantly improve business operations and overall guest experience in the aviation sector. In addition, the teams at Etihad Guest and Gulf Air Falconflyer loyalty programmes will shortly begin discussions benefitting members of each programme.